Sponge nail art is a very easy technique for creating colourful nail art designs. You just need a piece of sponge and normal nail polishes to create awesome patterns on your nails. This is the easiest technique and even a piece of sponge from your old cushion can become your nail art tool! Today, I will show you two different types of sponge nail art tutorials. 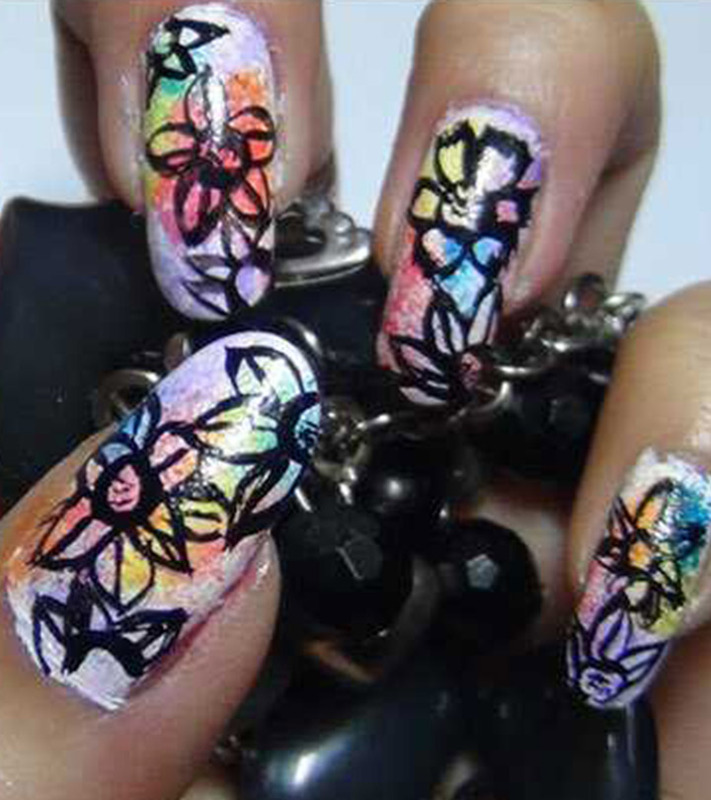 This is a floral nail art and you can easily do this at home. Use a base coat to protect your nails from the acrylic colours or chipping. Now use a layer of skin coloured nail polish. This will make the base more opaque. 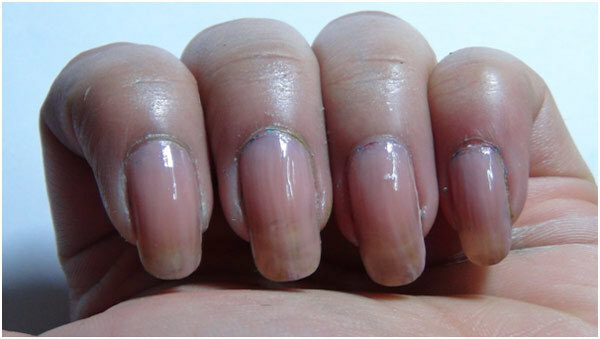 Once the skin coloured nail polish is dry; apply 1 or 2 nice layers of white nail polish. The white polish should be completely dry before you start work on the sponging effect otherwise the white nail polish may come off. 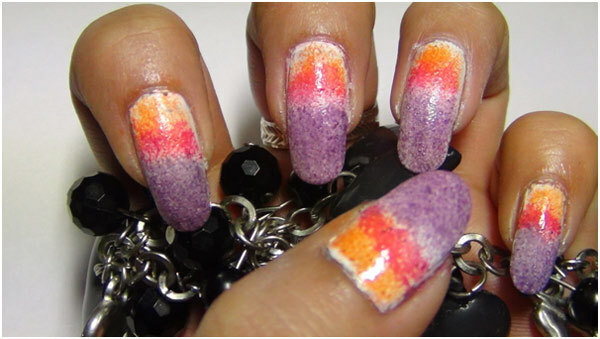 Next, take the piece of sponge and some purple nail polish to sponge up some colour like the image below. Do the same with the rest of your chosen colours. It should look like the pictures below. Now take your nail art brush and black acrylic colour. Make some circles. This will be the centre of the flowers. You can even use a straw for this. 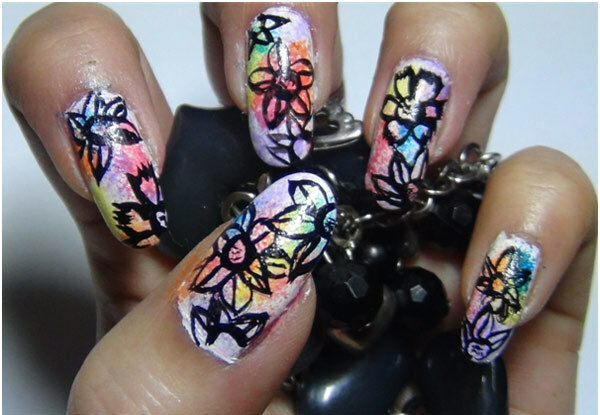 Next, take your nail art brush and black acrylic colour to draw some petals to complete the flowers. It should look like the illustrations given below. Let it dry completely and use a transparent top coat to seal in the design. This young design will reflect your youthful personality. You can sport it with outfits which have floral prints. You can also combine this nail art with your pastel coloured outfits. 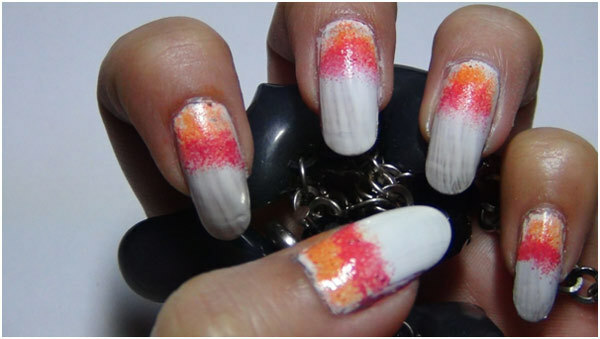 This nail art will also look appropriate for Holi. 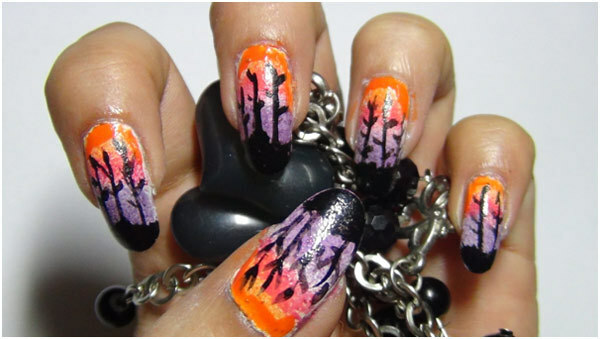 This is a scenic nail art using sponge which you can sport when you are going out in the evening or even camping!. It is very easy to do but requires a little bit of extra time. 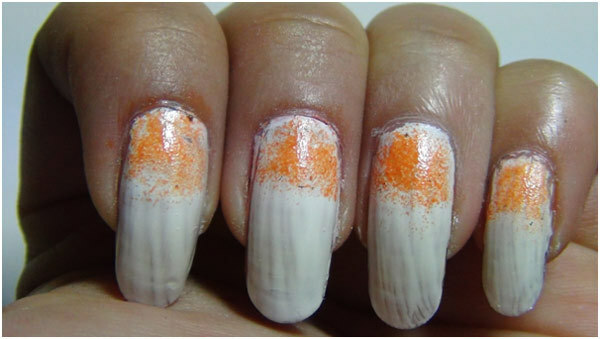 After you have applied the base coat and followed it up with a layer of white nail polish, sponge in some orange polish on the nails. It should resemble the design below. Now, take the pink polish and sponge up a layer of pink below the orange. It should look something like the image below. Now take the purple polish and sponge up a layer of purple below the pink like the picture here. After all the 3 layers of nail polish have been sponged up, take black acrylic color and your nail art brush. Make some lines. Each line represents one tree. So you can create as many trees as your nails can accommodate but make sure not to make it look too clumsy. Now draw up some twigs and branches. Lastly, apply a little more orange polish on the empty spaces at the top. Let the whole design dry properly before applying the transparent polish. 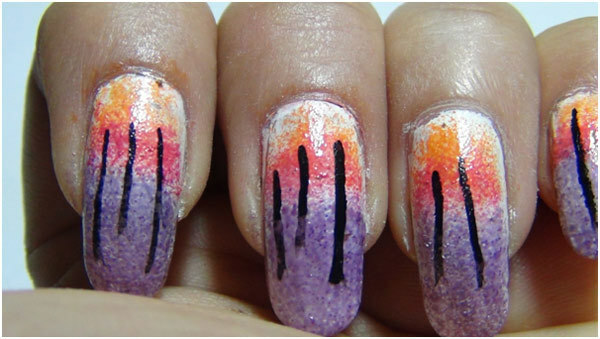 If your design is not dry and you apply transparent top coat, your acrylic colours may bleed. 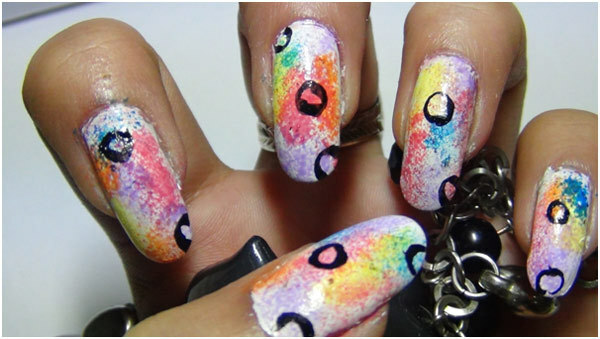 These designs are easy to create but go a long way in turning your nails into a piece of art! 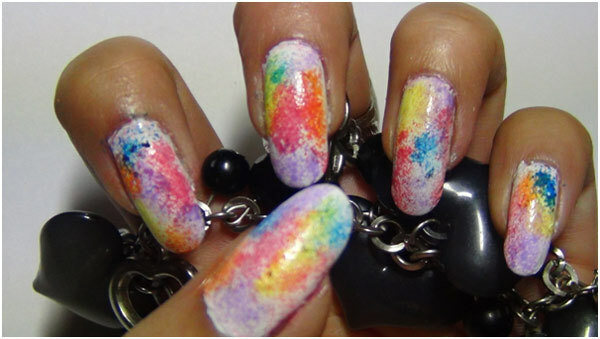 A little patience and steady hands are all you need to sport these amazing nail art using sponge. Hope you enjoyed both the designs and will try these out. 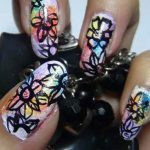 Do share your ideas about nail art. We would love to hear from you!